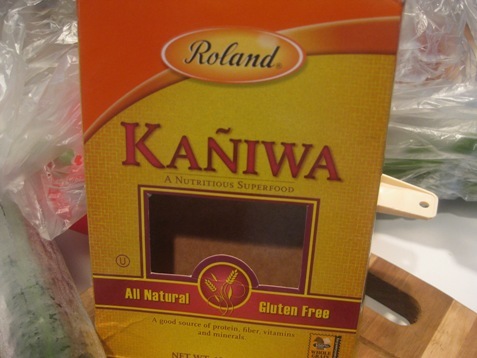 Kaniwa from Roland Products, pronounced “Ka-nyi-wa”, is a staple grain of the ancient Aztec and Incan cultures whhich has been cultivated for thousands of years throughout South America. 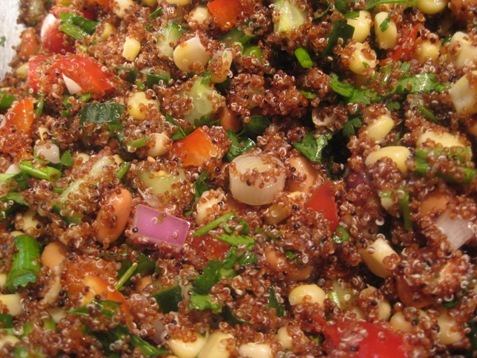 The crunchy, earthy grain is loaded with protein and makes a complete meal when mixed with vegetables. Roland Foods offers a wide variety of specialty foods from around the globe and was kind enough to send me this box of Kaniwa to try at home. 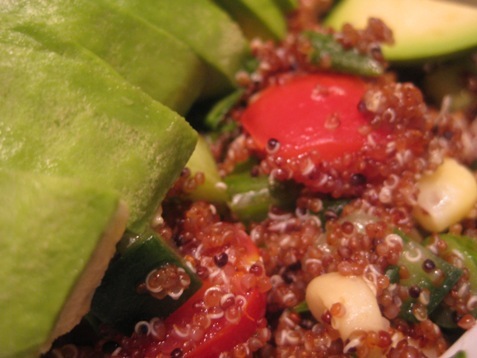 I have cooked with Quinoa in the past and I love it. 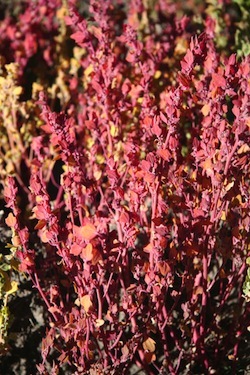 Kaniwa is similar to quinoa but seems to feel hardier and denser. 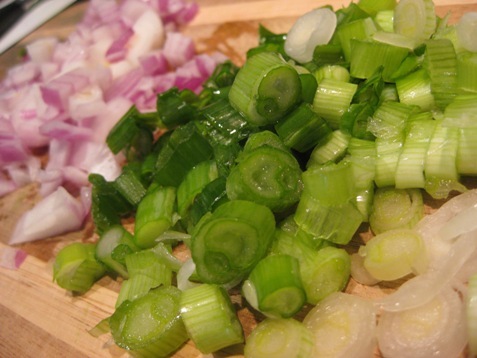 I gathered all the vegetables I could find and chopped them to equal size. 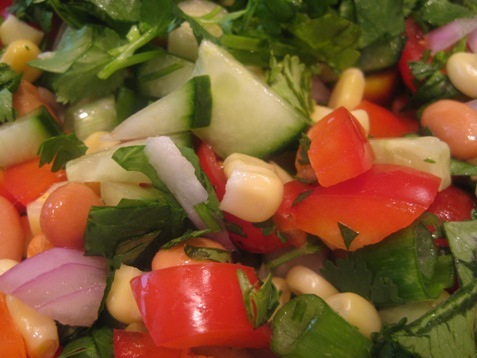 1 package of Grape tomatoes cut in half, 7 green onions, 1/2 of a red onion, 1 can of pinto beans, 2 cups of corn, 1 red pepper, 1/2 of a English cucumber, 1 bunch of cilantro,the juice of 3 limes, 1/4 cup of olive oil and salt to taste. I put all of the chopped vegetables in a bowl, cooked the 12 oz. 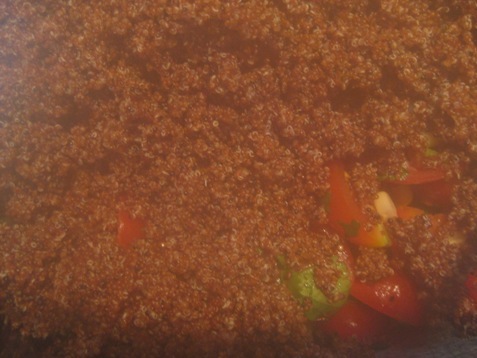 box ( about 2 cups ) of Kaniwa and added to the veggies. 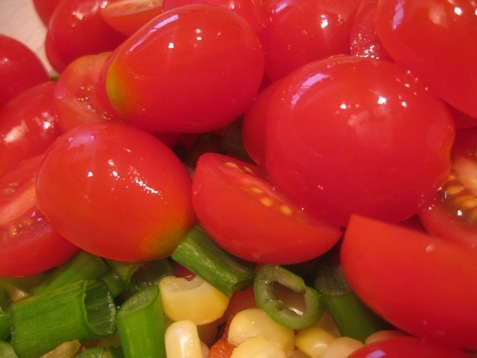 I added it hot to the vegetables to bring them to peak flavor. 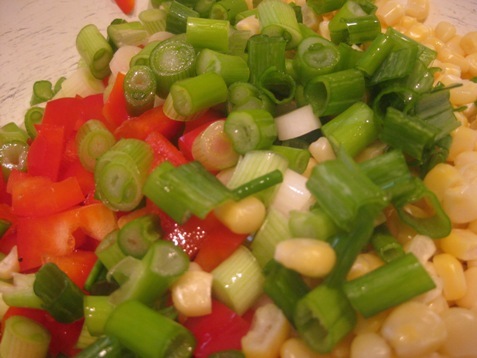 I find that adding hot grains to the veggies gives off just enough heat to liven the flavors. I mixed everything then added the olive oil and the lime juice. Serve and garnish with half an avocado. 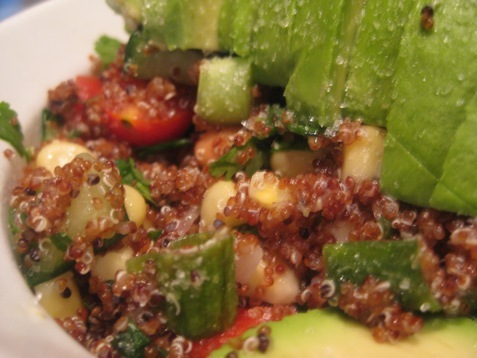 Everyone loved this vegan, protein rich meal which could also be great as a side dish with grilled salmon. 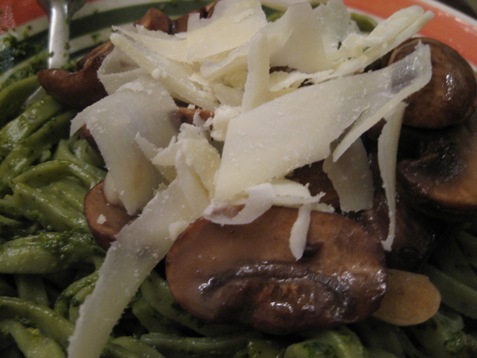 Spinach fettuccine with sauteed baby portobello mushrooms, pesto and shaved parmesan makes a great meatless, filling and nutritious meal. 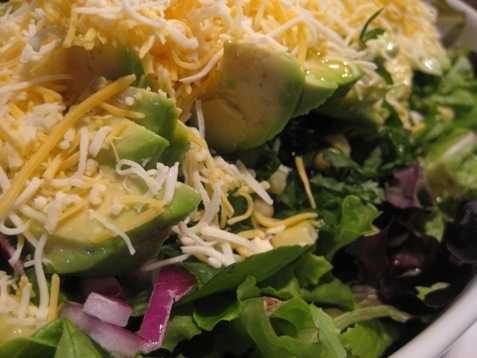 Along with this beautiful salad of fresh yellow peppers and avocados our vegetarian meal satisfies everyone. 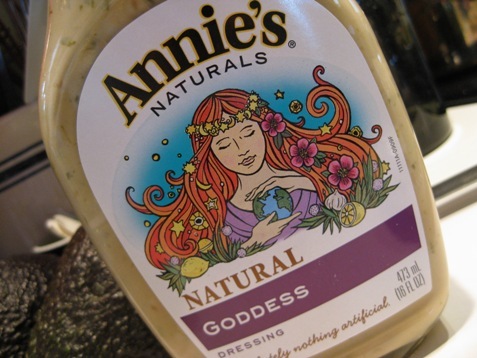 Annie’s Green Goddess dressing makes this salad heaven! 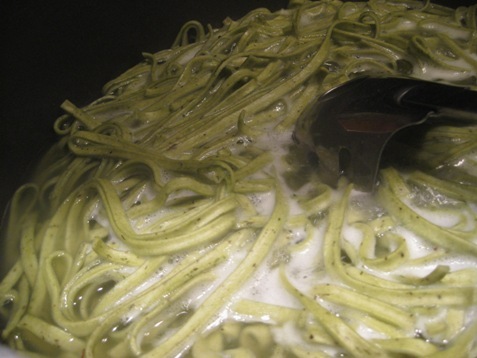 Boil spinach fettuccine, al dente. 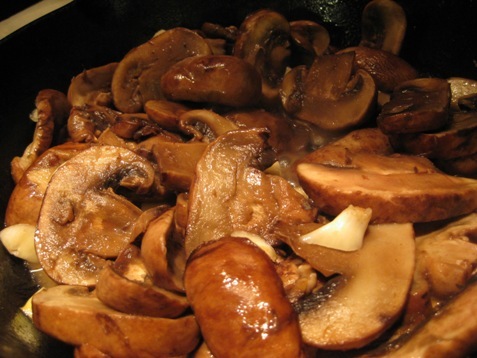 Sautee the mushrooms with olive oil and garlic slices. And mix in your favorites. I love basil pesto which I make myself. I make it vegan and fresh! 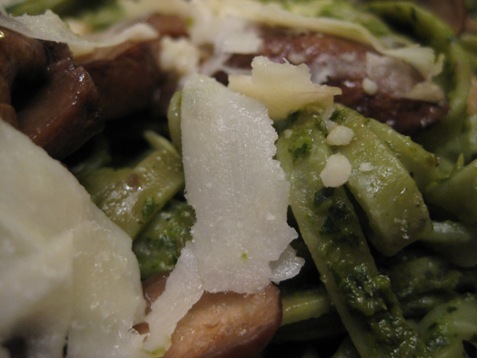 Shaved parmesan and a drizzle of olive oil make this fantastic! 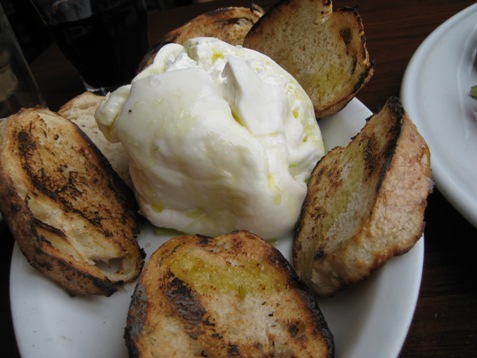 Spacca Napoli in Chicago for Authentic Neapolitan Pizza and Beautiful Cheeses! 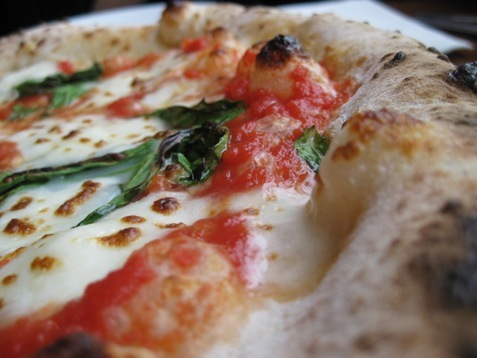 Spacca Napoli on West Sunnyside in Chicago is the home of beautiful fresh ingredients, bufala mozzarella and huge wood burning pizza ovens. “Spaccanapoli” is the old quarter and heart of Naples, Italy. 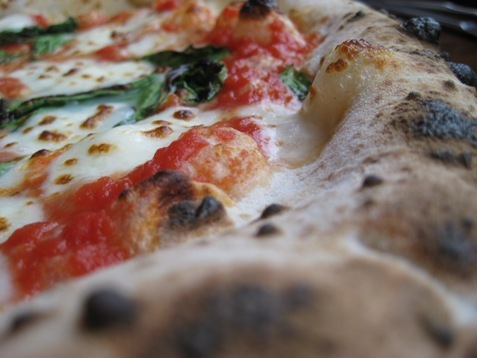 Naples is famed as the birthplace of pizza. 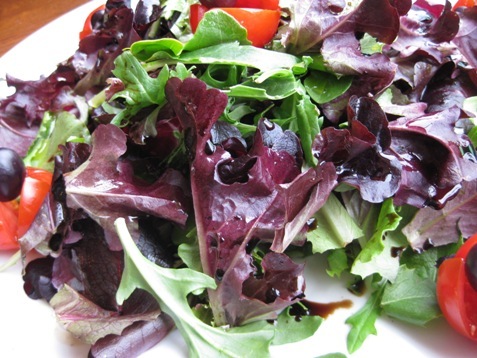 Mesculin greens with a light balsamic dressing. 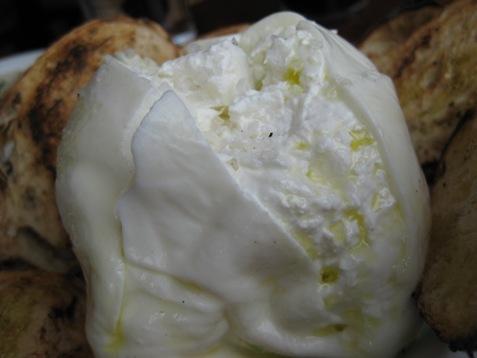 The special today; mozzarella bufala with olive oil and sea salt. 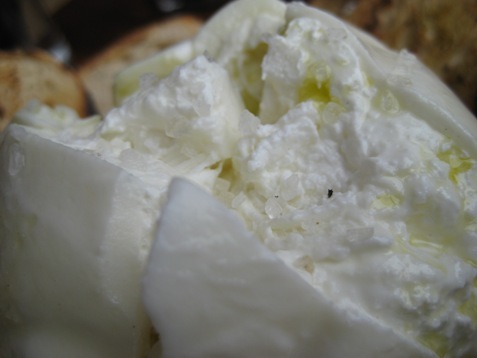 This didn’t last very long and it worth the trip for the cheese alone! 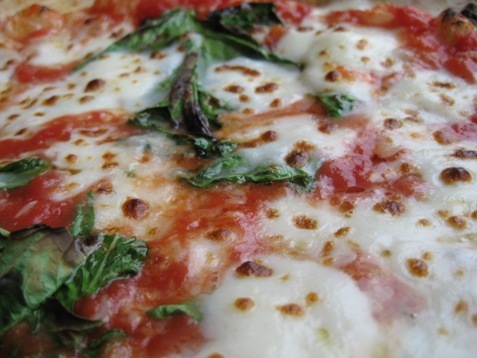 Pizza is wood fired and thin crust. 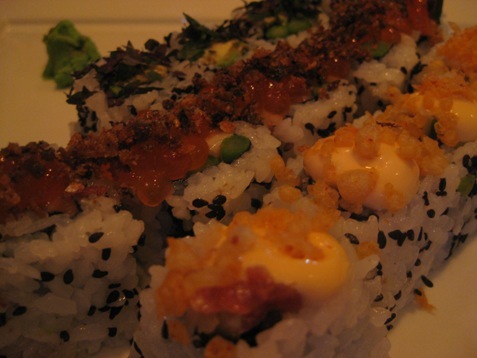 Fresh ingrediants and light sauce create a heavenly balance of flavors. Sushi, Scallops, Hearts of Palm and Polenta at Dante! 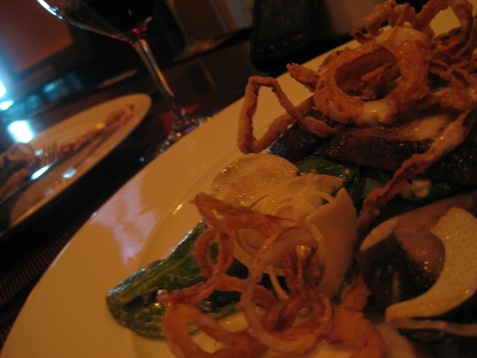 Dante was the scene of a fabulous late night supper and wine tasting. 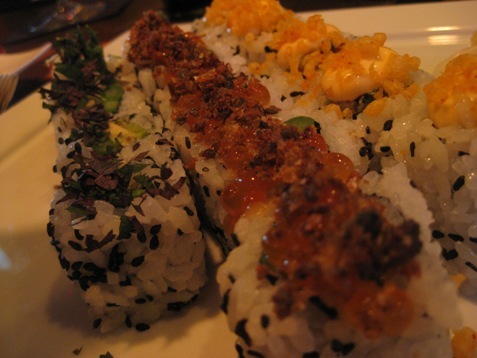 Not only did Dante roll sushi just for us; Sushi is a happy hour hour item and we were well past happy hour! But he was gracious enough to accommodate my lust. I find that it is best just to sit back and enjoy. I never order. I just graciously accept what this world class chef puts in front of me. 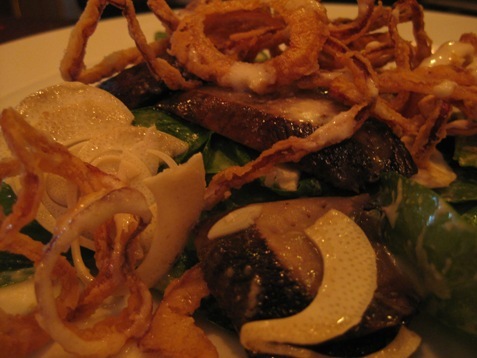 Hearts of palm with spinach, portobello and ginger vinaigrette was amazing with crispy fried red onions. Our bartender kept the wines flowing as we took a world tour of reds from Italy to France, California and South America! There were Petite Sirah, Zinfandel, Pinot, Malbec….. 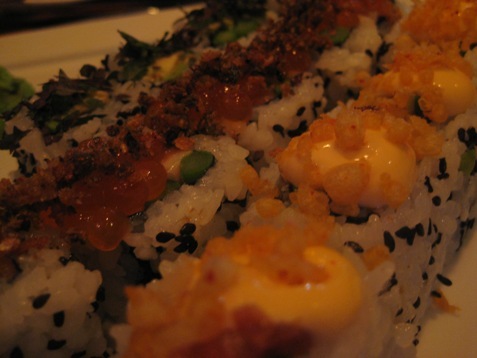 This was, by far, one of the best dining experiences that I have had in a while. Dante is a true gem! In Cleveland or otherwise; world class! 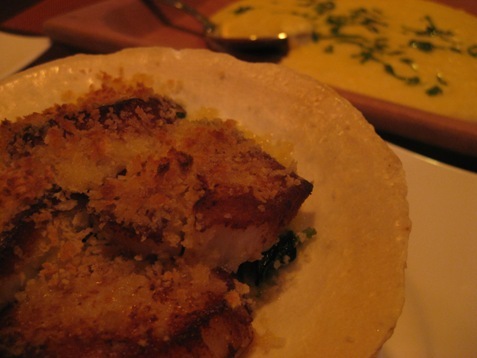 Scallops and polenta are divine! Something light and “springy” was on my mind today. 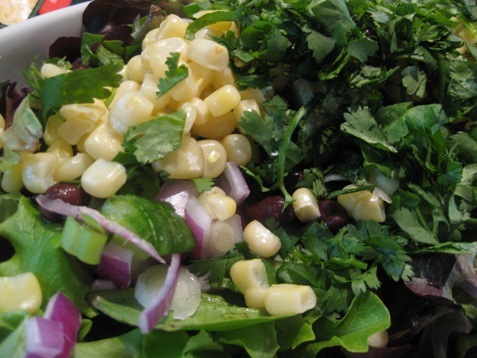 A chill in the air did not stop the sunny skies from inspiring a salad full of all my favorites; avocado, black beans, corn, red onion, scallions and cilantro! 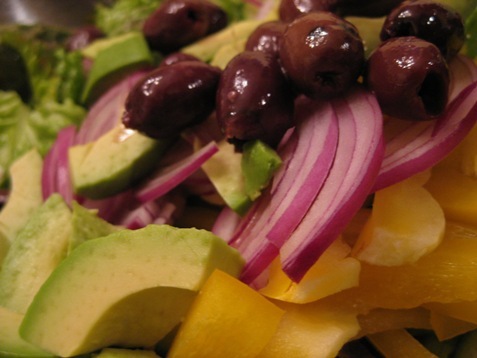 Lime and olive oil dressed this salad and allowed all the flavors to come through and keep it light. 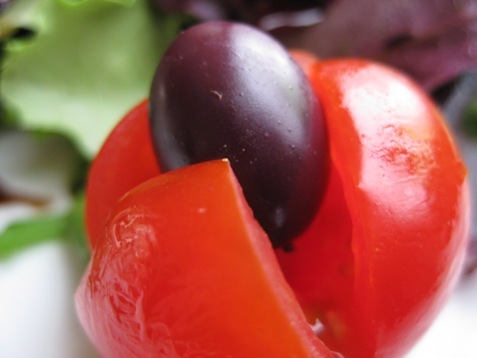 You can get really creative with tomatoes, olives, peppers…I used what I had on hand. 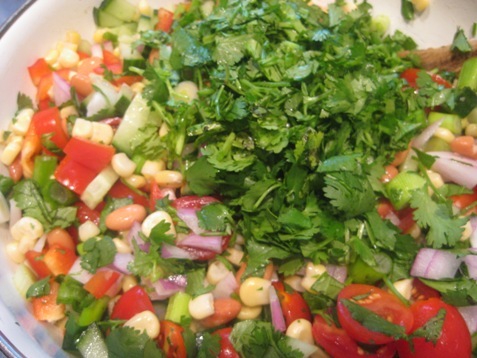 I tend to go heavy on the cilantro!